BRIDGE OF SPIES. In 1957, accused spy Rudolf Abel scores insurance attorney James Donovan (Tom Hanks), a veteran of the U.S. legal team at the Nuremburg trials as his defense. While their pairing sends a global message that everyone is entitled to the best defense, it's clear that everyone from the judge to the intelligence community has a guilty verdict in mind. But the trial serves mainly as a foundation for the attorney-client story between Donovan and Abel (a dryly excellent Mark Rylance), a jumping-off point for director Steven Spielberg to weave an outstanding tale of Cold War-era machinations. The rest of the film, which builds smartly on a script co-written by Joel and Ethan Coen (! ), involves negotiating a trade for Abel's return to the Soviets in exchange for U.S. pilot Francis Gary Powers, shot down over the U.S.S.R. in May 1960. All this is to be spearheaded by Donovan during a snowy, menacing Berlin winter that will be familiar to any fan of John le Carre, and still grippingly entertaining to those who are not. This is a surreal, true-to-history world, after all, involving trades of prisoners on Glienicke Bridge and coins as vessels for smuggling tiny documents and poisons. Two historical concepts in Bridge of Spies appear somewhat novel in the long view of history. First, the film is set in an era in which the specter of nuclear annihilation was not an abstract idea, but something weighing upon Americans daily and rattling children nearly out of their wits. Second, Donovan's defense and counsel of Abel, at trial and in the negotiations that follow, speaks to the better angels of America's nature — the idea that the Constitution protects even foreign nationals accused of spying within the U.S., from their trial to their access to appeal and their rights even after sentencing. Much as with Spielberg's unfairly under-seen Munich, events of the past are played out to resonate in the now. Parallels to the politics of Guantanamo would be hard to miss, but aren't written with a sledgehammer. They emerge instead within a crackling, darkly funny story. PG-13. 143M. BROADWAY, MILL CREEK. 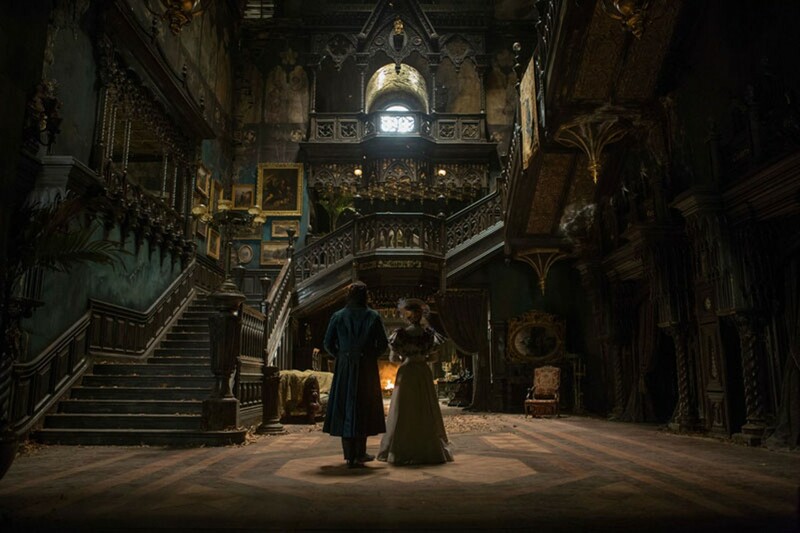 CRIMSON PEAK. Guillermo del Toro is a man with a particular vision of the world. Strike that — a man who builds new worlds as he imagines them from the ground up, with primordial stews gurgling and hissing up from the depths and bizarre machines of non-Euclidian design wheezing and groaning ominously. In such unsettling dazzlers as Hellboy and Pan's Labyrinth, the mad-scientist touches that get people hyperventilating at Comic-Con also come with a love of mythic storytelling. We find ourselves in Buffalo, New York, in 1901 — forget what you think of that frosty rust belt burg, because for these purposes it's dead center for the most gothic of tales. Edith (Mia Wasikowska) is a writer in her 20s living with her wealthy builder father (Jim Beaver). This exposition all comes after some rather disturbing flashbacks to Edith's childhood, and with some skullduggery that will ultimately leave her bound for England to wed Sir Thomas Sharpe (Tom Hiddleston). Hiddleston exudes a great ominous gleam in this role. Thomas and Edith settle into his spooky family manse of Allerdale Hall, a decaying wonder that is the real star of the film, along with the third-wheel company of Thomas's wickedly weird sister Lucille (Jessica Chastain). While del Toro provides ants devouring butterflies, terrifying apparitions lounging in bathtubs, blood-red clay flowing from the floor and walls, and Edwardian muttonchops aplenty, there's a problem in tackling a genre tale like this. Gothic drama predates and even transcends film, and its conventions don't leave much room for characters to break out, even with all the dramatic, visceral action in the third act. As always, it's a breathtaking visual wonder in all the best and darkest ways. And it all just made me wish again that del Toro could raise the cash to make his thwarted adaptation of H.P. Lovecraft's At The Mountains of Madness. R. 119m. BROADWAY, MILL CREEK. JEM AND THE HOLOGRAMS. Tween pop-star movie based on a second-string Barbie toy with a robot. Seriously. PG. 118m. BROADWAY, FORTUNA, MILL CREEK. THE LAST WITCH HUNTER. Vin Diesel and recovering hobbit Elijah Wood battle baddies in a dream dimension. PG13. 106m. BROADWAY, FORTUNA, MILL CREEK. PARANORMAL ACTIVITY: THE GHOST DIMENSION. Spirit photography, handheld cameras and found footage. You know the drill. R. 88m. BROADWAY, FORTUNA, MILL CREEK. ROCK THE KASBAH. Bill Murray as a washed-up rock manager trying to get a young singer onto a kind of Afghani Idol. R. 106m. BROADWAY. STEVE JOBS. Michael Fassbender pulls on a turtleneck for this Apple CEO biopic. R. 122m. BROADWAY. DIGGING FOR FIRE. Engaging comedy about married 30-somethings (Jack Johnson and Rosemarie DeWitt) on wild goose chases. R. 96m. RICHARDS' GOAT MINIPLEX. GOOSEBUMPS. Jack Black plays author R.L. Stein, who's trying to return his fictional creations to their books. PG. 103m. BROADWAY, MILL CREEK, FORTUNA. HOTEL TRANSYLVANIA 2. Adam Sandler voices a grandpa hanging onto his blended vampire-human family in this animated sequel. PG. 90m. BROADWAY, MILL CREEK. THE INTERN. Robert DeNiro plays a retiree with an internship at an online fashion company. With Anne Hathaway as his boss. PG13. 121m. BROADWAY, MILL CREEK. THE MARTIAN. Ridley Scott directs Matt Damon as a stranded astronaut in a compelling, exciting and beautiful space drama. PG13. 141m. BROADWAY, FORTUNA, MILL CREEK, MINOR. PAN. Peter's backstory and first trip to Neverland with pirates, fairies and floating galleons. Starring swashbuckling Hugh Jackman. R. 121m. BROADWAY. SICARIO. Director Denis Villeneuve's intense, well-acted and masterfully shot drama about an FBI agent tumbling down the rabbit hole of the US/Mexico drug wars. Starring Emily Blunt and Benicio Del Toro. R. 121m. BROADWAY, MINOR. A WALK IN THE WOODS. Robert Redford and Nick Nolte play old friends testing their knees and their bond by hiking the Appalachian Trail. R. 104m. MINOR. WOODLAWN. Caleb Castille stars as a black football player on a newly integrated Alabama high school team in the 1970s. PG. 123m. BROADWAY.